In addition to adding your own photos to your website, you can use an included collection of royalty free stock photos. Your initial stock image choices are based on which category you chose for your site, but you can search by keyword to see even more choices. Click any section except the Contact Us or footer sections. If you clicked the first section, click Cover Image in the Header panel. For other sections containing photos, click on the photo you want to replace. 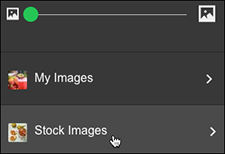 Click Stock Images in the Edit Image panel. Scroll through the photo grid to find a photo you like, click it and it automatically replaces your previously selected photo. 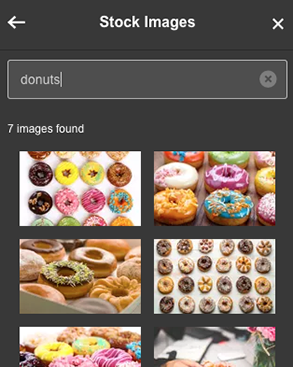 Or enter a keyword in the Search stock images field to see other photos, and click one in the grid to select. Note: If there are still more stock images available for your chosen category, just scroll through the grid to find one you want to use.